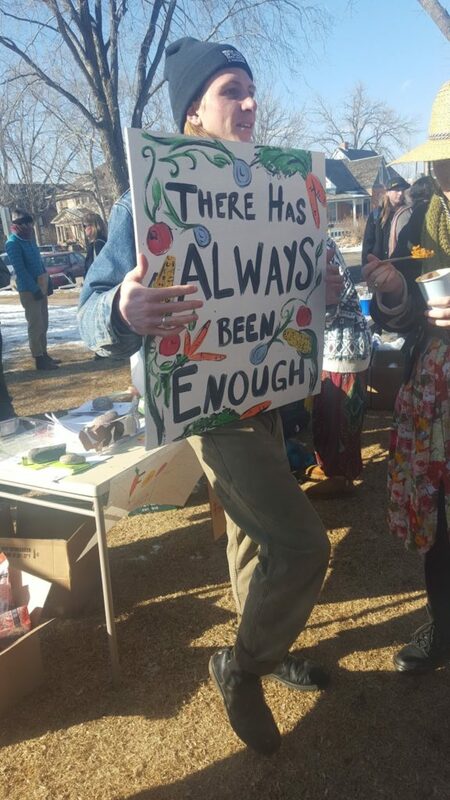 Note: On Sunday, February 10th the Fort Collins Homeless Coalition (FCHC) organized a rally in solidarity with Food Not Bombs and in support of the right to share food in our parks. 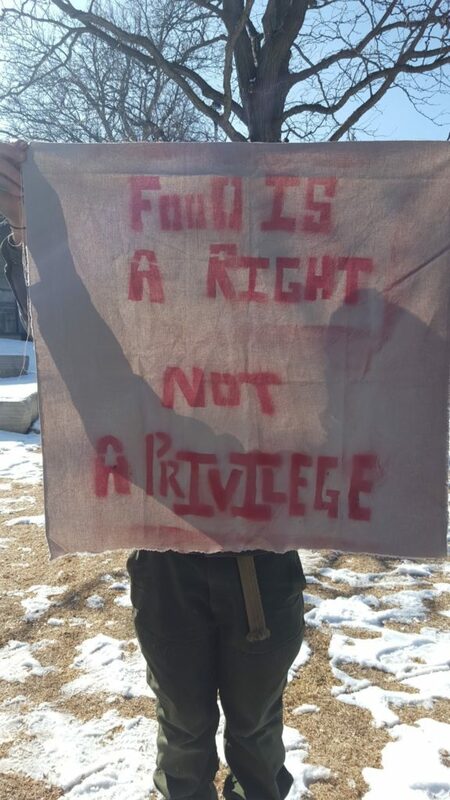 FCHC is continuing to collaborate on this effort to secure the right of people in our community to share food (without facing threats of tickets, fines/fees, harassment, or unfair restrictions). Having such a great demonstration of support makes a big difference- thanks to everyone who showed up and made it a joyful act of resistance. We’ll continue updating here and sign up to receive FCCAN’s Action Bulletin for more opportunities to get involved. And come show your support at Food Not Bomb’s Zine Release Party this Friday! We have been holding community picnics for about two years now, under the name of Food Not Bombs. We believe that nutritious food is a human right, not a privilege. We believe that it is a moral failure of all of us that there are members of our community who go hungry– especially in this day and age when a staggering proportion of cultivated food is destined for landfills. 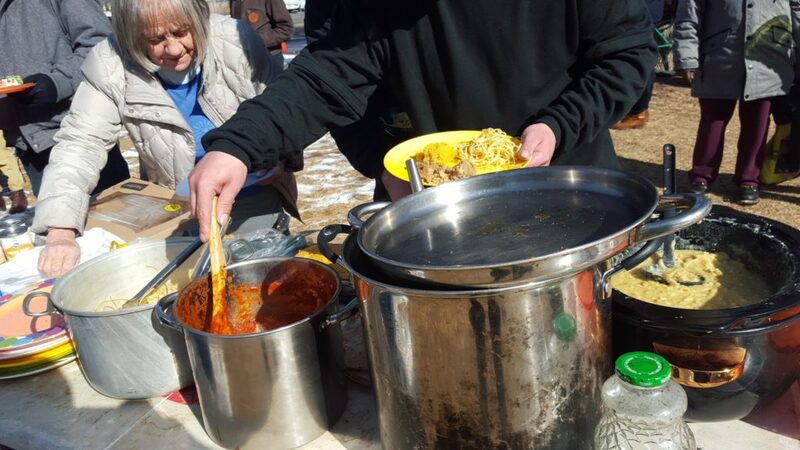 We have been gathering every week at the library park to share food and company with those who are hungry. 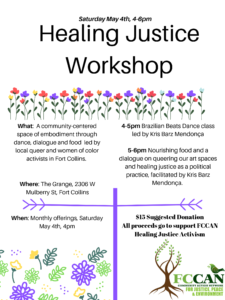 It is a nourishing time for both body and soul, as the community comes together and stand with each other in defiance to the system that manufactures and perpetuates poverty. We chat, listen, sing, dance, and of course, eat. These picnics that brought us closer to the houseless community within the city and gave us opportunities to listen to the houseless folks and their struggle against the city authorities that want to criminalize their existence. Unfortunately, our picnics did not always draw positive reactions from the folks in the neighborhood. Some neighbors have come up to the meal table and accused us of attracting houseless folks to the park and hence creating problems that they always seem to (wrongly) conflate with houselessness itself. We were disheartened by these interactions, but it was not until the threats escalated that we truly felt the need to speak up and stand our ground. Two weeks ago, we were notified by the library security that someone had called police on our meal service. The following week, the police shut down our community picnic. The police stated they had received a call about a dog off leash, but then refused to leave and threatened to give us citations until the picnic was taken down entirely. We were told that we will receive citations if we share another picnic without getting a permit. We were forced to pack up and leave without having served all our food. It is worth noting that the permitting process in “Fort Collins” is prohibitively expensive, and the city’s rules about what kind of events require permits are extremely vague. The rules, as they stand currently, call any use of the park that happens more than “once a week/month” an event which requires a permit. The park also cites an increased load on the public infrastructure as a reason for them to strictly restrict the use of their parks but 1) most, if not all, folks whom we serve are already present at the library at the time/day and 2) even if every single person we served is attracted to the park solely because of our meals, the degree to which it impacts the overall library attendance is marginal at best given the size of the picnic. Therefore, it is evident to us that the city is selectively applying these intentionally vague rules to further marginalize the poor and houseless folks within our community. One must wonder what kind of treatment we would have gotten if everyone showing up to the picnic was a housed, wealthy, middle-class person. Interestingly, this fight is not unique to “Fort Collins” – the Fort Lauderdale Food Not Bombs has experienced almost identical struggle a few years ago that resulted in prolonged legal fight. They too argued that the city ordinance was unjustly violent against the voice of the people. Eventually, the Eleventh Circuit Court of Appeals ruled that banning such gathering is against the First Amendment of the “US” Constitution, allowing Fort Lauderdale Food Not Bombs to continue their community picnics. Since then, this case has been used to defend numerous Food Not Bombs friends around the country. “Fort Collins” as a community has time and time again attempted to further oppress the poor and houseless folks. 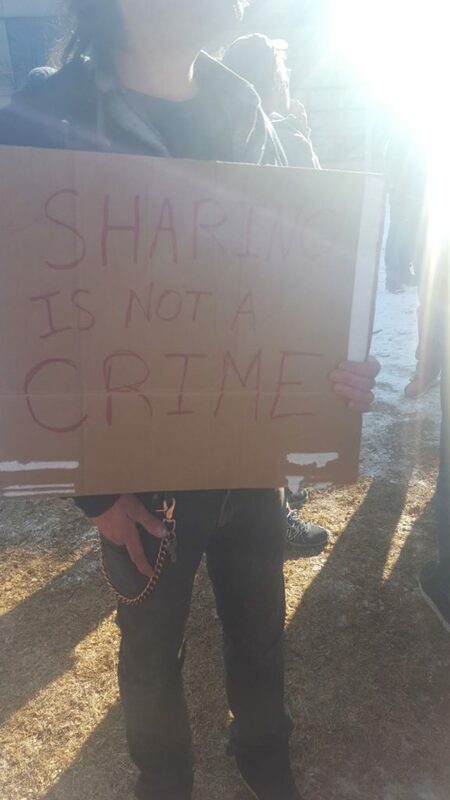 During the Mennonite Church’s fight to host a few lockers for the houseless folks, we have all witnessed the strong reactionary opposition from some people in the neighborhood that accused the houseless folks of drug use, “disorderly conduct”, and so-called crimes. City now has imposed unrealistic amendments to the operation of the lockers, rendering the program effectively impossible. Similarly, the Sit-Lie Ban was an inhumane, targeted assault on the houseless folks that aimed to brush under the rug the failure of our economic system to meet basic human needs. The city has always chosen to cover up their own shortcomings with a suffocating blanket of apathy to uphold the manicured fantasy that is the downtown “Fort Collins”. We prefer not to have to appeal to the authority just to help our neighbors, whether that authority be the city council or the Eleventh Circuit Court of Appeals. We dream of a world where helping each other is a right and a responsibility, not an illegal action. However, Food Not Bombs, as well as our compassionate friends are ready to stand our ground. If the city tries to push us out to the fringes, we will continue to fight for our rights and for the well-being of our community.